The National Australian Built Environment Rating System - NABERS, measures the environmental performance of buildings and tenancies. The system uses real, measured impacts and communicates these in a clear and simple way. For commercial offices NABERS Energy rates the energy efficiency of an office base building - whole building or tenancy - by comparing its measured energy consumption against a set of benchmarks, developed using actual building performance data, which is probably one of its strongest features. NABERS Energy assesses a building or tenancy’s total energy use over a 12-month period collected from energy billing data and meter readings. The energy use per fuel source is multiplied by constant NABERS greenhouse gas (GHG) emissions factors to establish a benchmark performance. The benchmark performance is also to account for floor area, climate/location, hours of occupancy and equipment density to establish a benchmark factor. The benchmark factor places a building on a level playing field with comparable buildings in the same property market. The benchmark factor is not a kgCO2/m2 figure, but rather a value that enables a building to be located on the benchmark rating scale. This benchmark factor is compared to the star rating benchmarks, or performancetargets, for the property market in the building’s geographical location (state-based) to determine a star rating. A NABERS Energy rating is awarded based on the performance level the project has achieved. To achieve 4-star or above a building must have enhancements to building envelope and services over the minimum building code requirements. Ratings of 6-star usually involve on site generation of energy. NABERS Energy also calculates the greenhouse gas emission intensity of the building in kgCO2/m2 using current Australian National Greenhouse Accounting factors for greenhouse reporting purposes. NABERS Water measures the water consumption of an officebuilding. The consumption figures are adjusted for factors such as building area, hours of use, and climate. A NABERS Water rating can be improved by reducing town potable water consumption by using water from on-site sources. Once a benchmark has been set, a water performance target can be established. An audit assesses if the target is reached. It is recommended that the facilities manager incorporates a water management strategy for the building, which includes evaluating and improvement measures for water efficiency plus a routine maintenance inspection program. Water shortages are a significant issue in Australia and building designers and managers are encouraged to find ways to mitigate against this. One initiative that is becoming more popular is district water reuse systems, where for example a number of buildings in close proximity are connected. Sewer mining has also been undertaken on numerous projects, where the utility sewer main is tapped into, as a source of waste stream that is treated and reused within the building. NABERS Energy ratings are a mandatory requirement of the Commercial Building Disclosure scheme that requires any office with a lettable floor space >1000m2 to obtain and disclose the rating at the point of sale or lease. A building must achieve at least a 5-star NABERS Energy rating (among a number of other criteria) to be classified as a Premium or A Grade office, as per the Property Council of Australia (PCA) classification system. A building with a 5- or 6-star rating must include active energy monitoring and ensuring the mechanical, electrical and hydraulic systems are operating, as efficiently as possible. Government has set minimum standards on base buildings it will lease and/or own. High performing buildings, on average have higher investment returns. The Investment Property Database (IPD) data shows an average of 10.6% return on buildings that achieve a 5-star NABERS Energy rating and above, compared to 8.5% for 4 - 4.5 star and 7.6% for 3.5 star or lower. High-performing NABERS Energy buildings have 17% higher net income ($/sqm), have a 21% higher capital value ($/sqm) and a longer weighted average lease expiry by 45% . Property developers and portfolio owners commonly require ratings typically of >5 stars as a minimum energy performance target for new commercial buildings or those undergoing major refurbishment. At Aecom, we have seen that buildings with higher NABERS Energy ratings are not only better designed, but also better operated. By proving over the long-term that this sort of building is worth the investment of capital and time, the NABERS ratings scheme has become a mark of quality that designers, builders, owners and occupiers recognise and understand. The building in a Sydney suburb was constructed in 1989, it underwent a substantial refurbishment which was completed in 2016. The building was previously performing at 2.5 Star NABERS Energy and had served a productive 25 year life. The refurbishment involved stripping the building back to the main super structure and installing a new highperformance façade; full replacement of electrical services; and replacement of chillers and on floor air distribution. Main riser ducts and air handling units were retained, and variable speed drives added. Back of house lighting was refreshed to all LED. A variable air volume air distribution system replaced the original constant volume system. 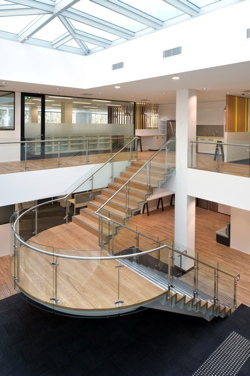 The works allowed for the re-creation of a high quality contemporary 7 storey Property Council A Grade, 5 Star NABERS Energy and 5 Star Green Star office building commensurate with the market expectations of tenants. As the newest and tallest A-Grade office tower in North Sydney, 177 Pacific Highway set new benchmarks in design and architecture. 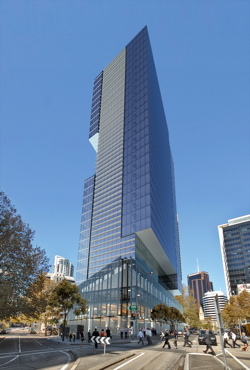 The 30-storey commercial office tower has achieved a 5.5 Star NABERS Energy rating without on-site generation or resorting to high cost HVAC solutions that often compromise on indoor environment quality.